“Where’s Corsica?” most people asked me. “Is it a country?” No, but fair question as it’s a bit off the beaten path when you think of traveling in Europe, especially for non-Europeans. Most of you are probably more familiar with the beaches of Southern France à la Nice, Marseille, Cannes and the like. Chic shopping along cobblestoned streets, fancy beach clubs with rows of orange parasols, and everyone decked out in white linen. The impetus to visit Corsica came mostly from a wedding invitation for a dear Swiss friend. 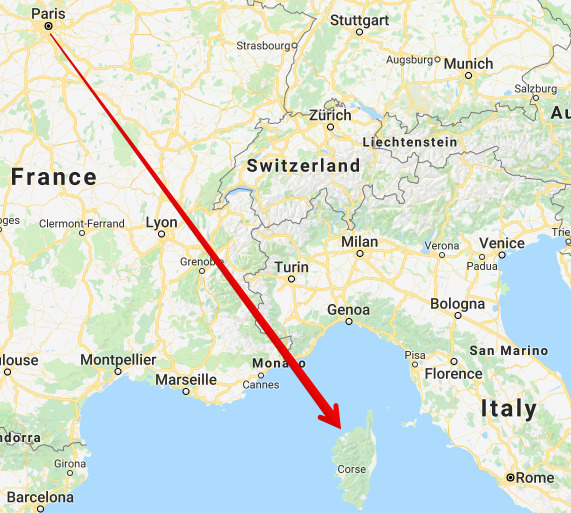 When my friends and I were deciding where to pre-game this wedding, we were torn between the South of France and Corsica itself. 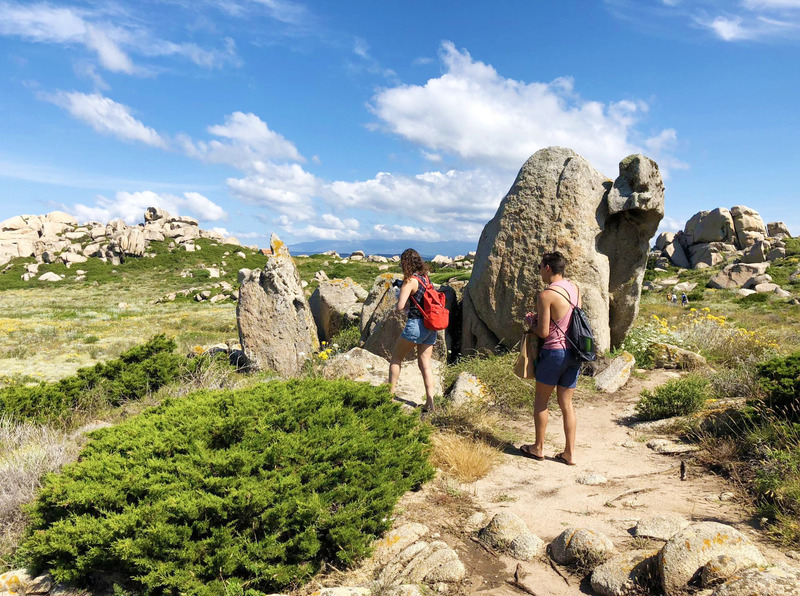 We ended up choosing to spend our time in Corsica as we would likely not have a reason to return, but we soon discovered that there are one million reasons to return again, and again. Corsica is truly a pearl of the Mediterranean. You like hiking and awesome rock formations? Got it. Secluded white sand beaches and crystal clear water? More beaches than you can count. French food? Oh girl, Corsica will hook you up with impeccable cheese and charcuterie, not to mention the local wine! You like wine? Cool, go visit the vineyards along the coast. 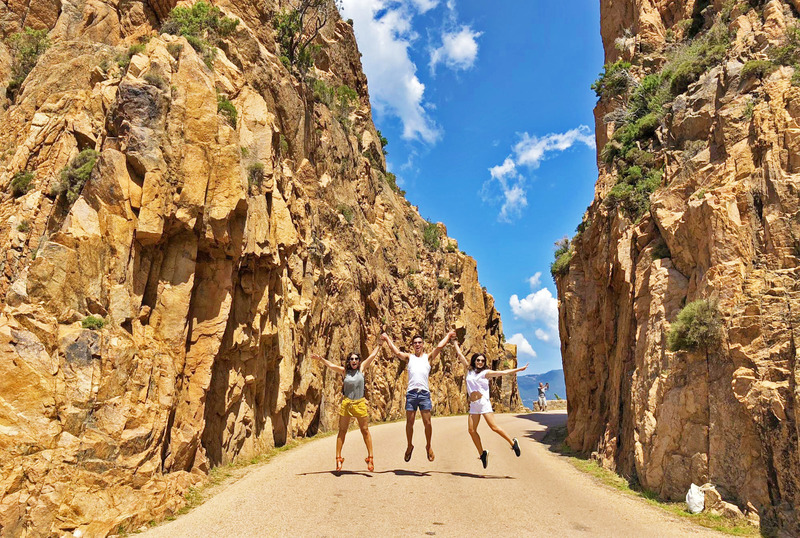 I’m telling you, Corsica has everything and if you want to plan a summer road trip in Europe, go to Corsica, it will not disappoint. def. Type A: relating to, characteristic of, or having a personality that is marked by being impatient, outgoing, ambitious, rigidly organized, anxious, proactive, and concerned with time management. def. Type B: a personality type characterized as easygoing and thought to have low susceptibility to stress. For those of you who are uber planners, I’m not knocking it. Certainly a degree of planning is very helpful or else you might end up homeless and stuck at a bus stop with the inability to communicate with locals. However, I’m advocating for you to take a step back and think about the type of trip you want to have holistically. Do you want to experience the place in its natural form as a local might experience it? If so, for optimal enjoyment and relaxation I recommend keeping your planning to a minimum and go with your gut in the moment. No decision should be difficult when choosing between all good things. All roads lead to bliss. Here are some of the tactics I picked up that will help you travel like you’re Type B, even if it only lasts as long as your vacation. To truly embrace the Type B lifestyle, you don’t want to plan an exhaustive itinerary because ultimately this will stress you out and undermine your ability to live in the moment since your primary concern will be checking off items on a list. Lists are for your day job——ditch them on vacation. Do reserve where you are going to stay ahead of time. By settling on your accommodations, the only thing you need to be concerned about is arriving there in time to sleep. 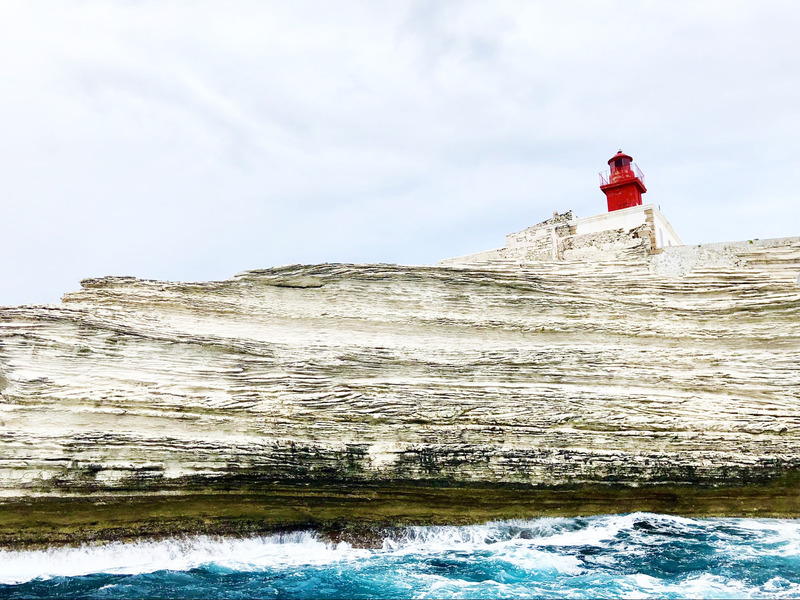 While there are loads of beautiful properties dotting the island, we chose to stay as central as possible so that we would minimize the driving time to get into town and could just walk out our door ready to go. The main towns we stayed in along the way were Bastia, Porto Vecchio, Bonifacio, and Ajaccio. 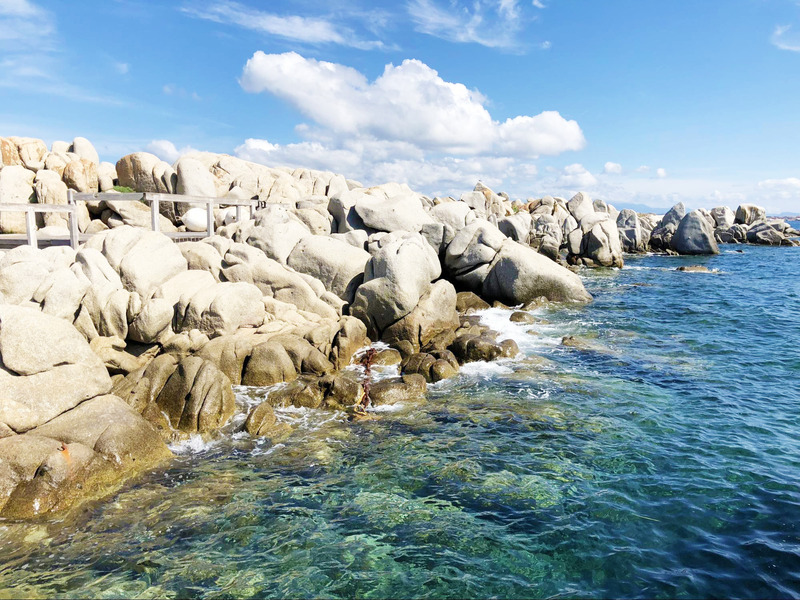 In order to see one of the notable UNESCO sites around the island, Piana, we picked a random town to stay in called Cargèse not because it is known for anything in particular, but because it was convenient. This ended up being one of the most valuable decisions we made. We were able to experience small town life by having breakfast at a local café and making some great connections with the locals who were eager to proffer us with advice. I made two food reservations for the entire trip, but didn’t end up making it to either. 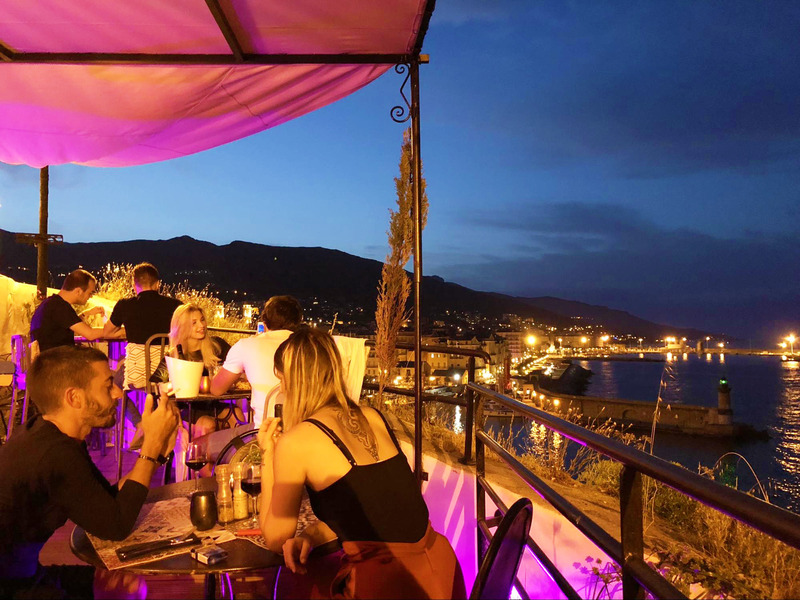 Once when we arrived in Bastia, our hotel called to make a reservation at one of the best places in town. Instead we got lost and landed at a quiet spot with young locals, which had a stunning view of the port at night. The other reservation was lunch at a vineyard in Sartène which we skipped because we were enjoying ourselves at the beach and couldn’t pull ourselves away. Don’t fret about missing your reservation, Corsica isn’t that kind of place. 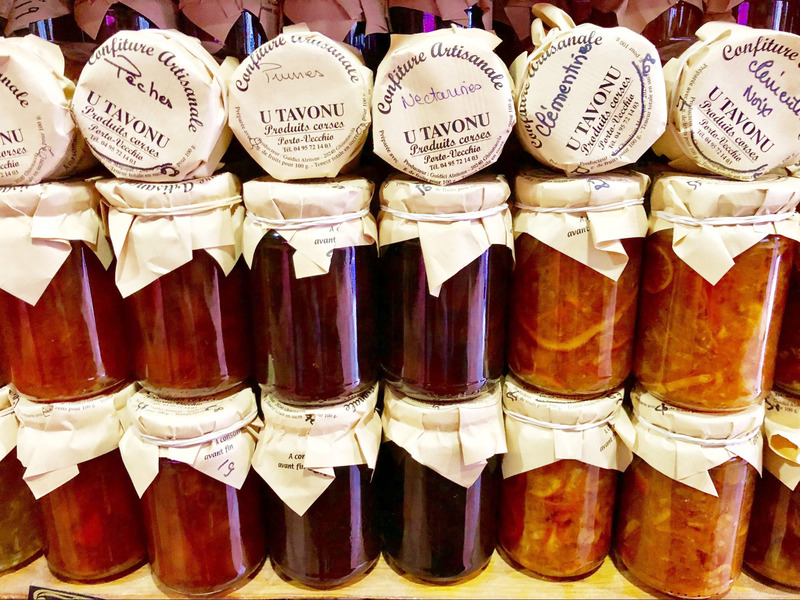 If you go in low season, you will not have trouble finding a place to chow down on a Corsican stew or fresh seafood. You should do some basic research to figure out the highlights for your destination. This will at least give you some direction when planning where to stay and your route. My favorite sources for pre-trip research is WikiTravel, any articles I can find in reputable food or travel magazines, recommendations from friends, and of course The InnBox. Your list doesn’t need to be a mile long, but it helps to know what the popular sites are and to figure out what you want to do once you get there. 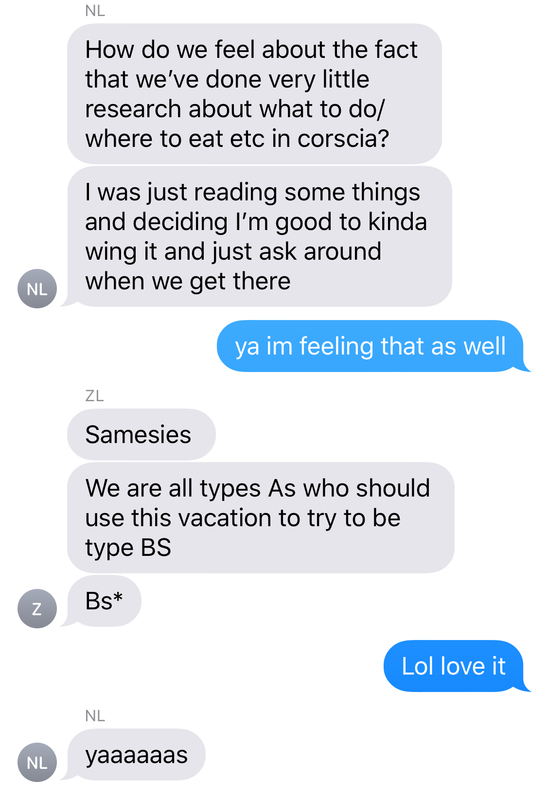 If you’re traveling with a group of friends, it’s ok to stray a little back into Type A territory before the trip in order to make sure everyone is okay with the game plan. We created a Google Doc where we threw in ideas from our cursory research and then had a quick phone call to regroup and make sure we’re all on the same page about our must-dos. Another bit of advice for group travel: download a bill splitting app like Splitwise. This will take all the stress away from constantly splitting bills and taking out money from expensive ATMs. Just keep your receipts, then upload them to the app when you have some downtime, it will automatically settle bills so you don’t have to do the nasty math. Instead of staying up late planning the next day’s itinerary, wake up, grab breakfast on the go and figure out what you feel like doing. By not making precious decisions ahead of time, you have the freedom to change around your schedule. One morning we decided to head to the beach first thing since we anticipated rain later in the day——this was the right call since we ended up getting stuck in a Corsican delicacy shop during a thunderstorm as opposed to an open coastline. We ended up befriending the shop owners who gave us some free white wine cookies, delicious! As with most trips, something WILL go wrong. A true Type B won’t let it stress them out because, well, they will figure out a Plan B on the spot! One of our musketeers was delayed an entire day meeting us in Corsica, so two of us all of a sudden had a free day to explore. This ended up being one of my favorite days of the trip. 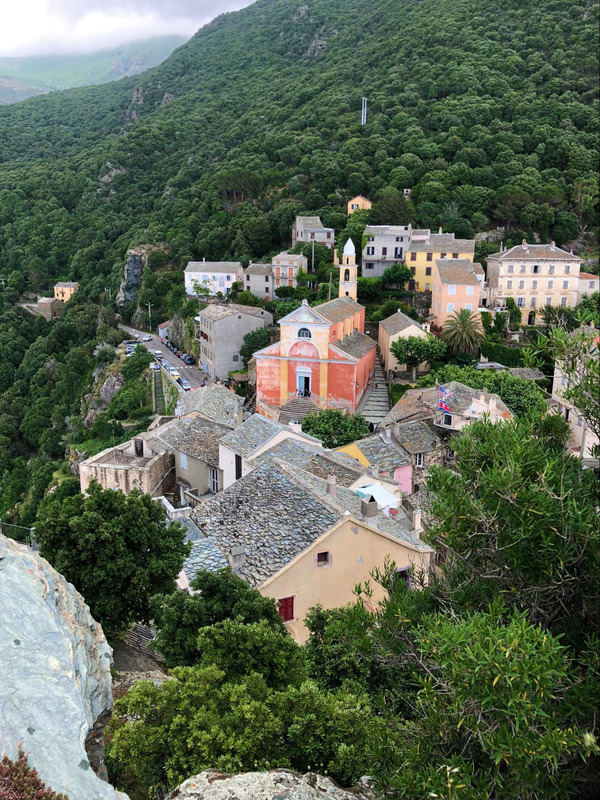 We asked the front desk at our hotel what towns would be worth exploring and she told us about this medieval town called Nonza about halfway up the Cap Corse peninsula. The ride was absolutely stunning, winding roads through canopies of green trees and cows grazing in fields. Finally we stumbled upon this beautiful town, overlooking a black sand beach—very dramatic. We had some Aperol Spritzes with a view, and hiked down to the beach, then headed back to Bastia to pick up our friend. Had we planned our trip to a T, we would have missed out on this gem, which brings me to my next point. Remember that random town we stayed in, Cargèse? We did not have anything planned for dinner upon our 10pm arrival, so we asked the old man who ran the hotel where we should go. He recommended a local spot by the harbor, Le Cabanon de Charlotte. Located at the bottom of a long winding pitch black road with a sky full of stars, we finally arrived at this beautiful restaurant and were greeted by the kindest soul, Charlotte herself. Her parents owned her namesake restaurant and passed it down to her. 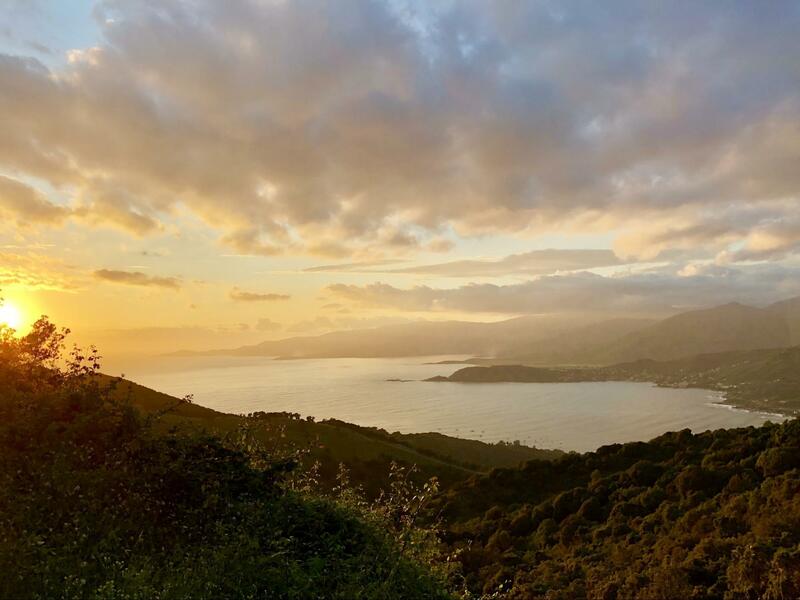 She loves Corsica and shared her love for it with us. 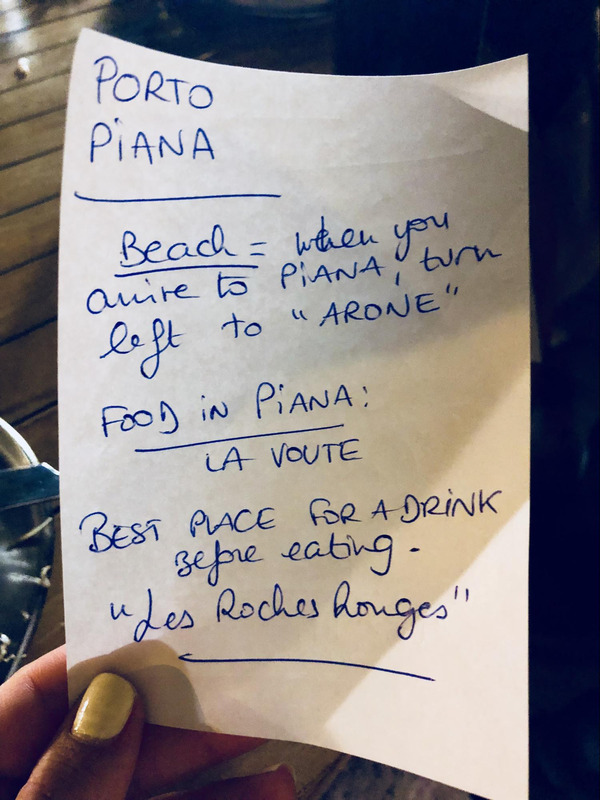 After ordering two phenomenal bottles of Corsican red wine and a whole fish for each person, she briefed us on what to do the next day after we visited Piana. Whenever someone gives me a written note full of recommendations I cherish it more than any souvenir. Of course, befriending the locals also means you get some perks. 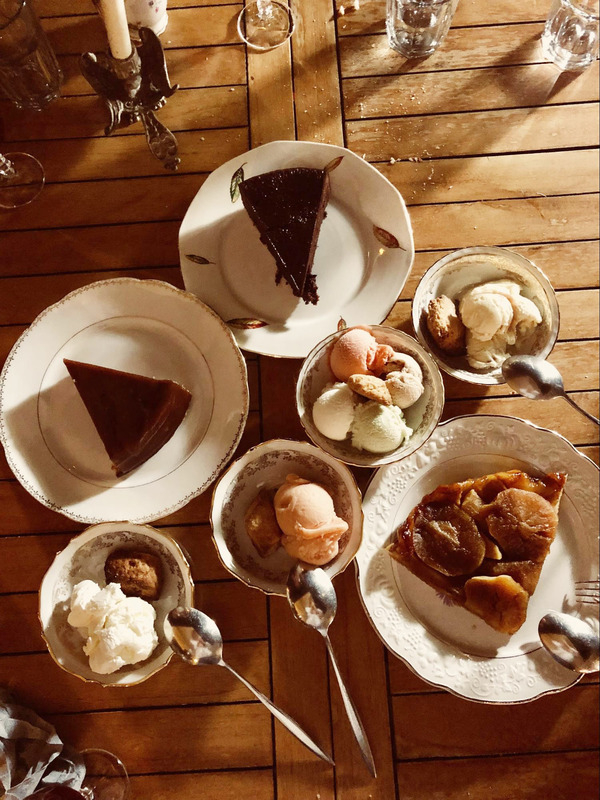 With Charlotte it meant 13 scoops of ice cream and one slice of each cake off the menu. Keep your eyes peeled for Chestnut cakes, a local favorite on the island. Whatever the primary mode of transportation is at your destination, take it. Be it a car, Vespa, or motorbike, being able to get around on your own terms at your own pace will allow you to be as flexible as you can be. Stop along the road for that photo-op, hunny. There are two primary benefits of having your own ride. You don’t have to stick to schedules for public transportation, which can rudely interrupt your Type B non-itinerary. You will also never be hangry as you can always pull over and pick up some snacks. 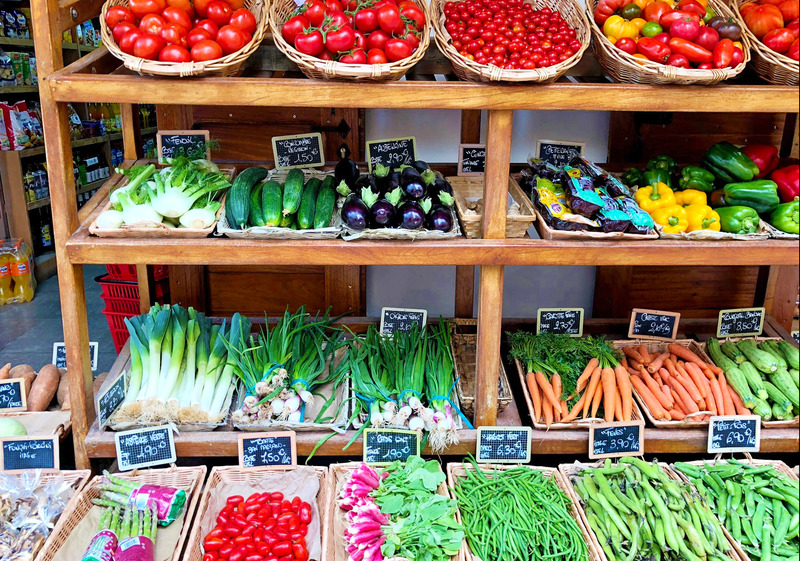 Our eyes were constantly peeled for fresh fruit stands and grocery stores to stock up on Rosé which we leisurely sipped every night on our hotel balcony while getting ready for dinner. Word to the wise, make sure you budget for a rental car on a European island as there are limited numbers of automatic vehicles available. They are also...expensive, approximately 5x more expensive, so learn to drive manual if you get the chance. There are all sorts of vacations you could take; cities like Paris, beaches like Tulum, safaris in Tanzania, and you can travel like you’re Type B in each of them. All you need is just the minimum amount of planning, a willingness to go with the flow, and maybe some friends on the same page. 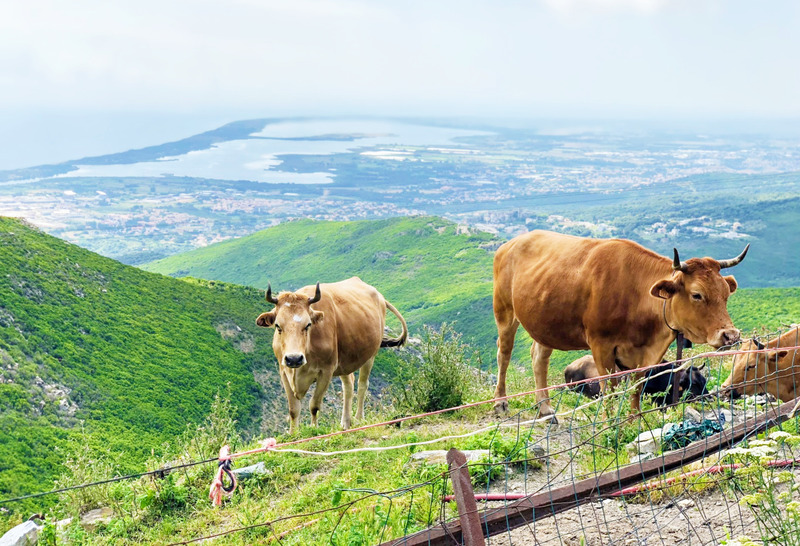 A Corsican road trip is an ideal first trip to get your feet wet with this lifestyle. For a run down of the places we hit on our road trip and some that we didn’t (because we’re Type B) check out this Google map. As a little bonus, here’s the ultimate Corsican Roadtrip Playlist we swore by every day. Make the trip your own, there’s so much to discover. Arielle works in Product by day and spends her free time exploring her own city, New York, and planning trips to off the beaten path locales before they become the hot new thing. She’s a sucker for French pastries and ethnic eats. Her next trips include Copenhagen for some summertime hygge and Bolivian salt flats for some 4x4 adventuring. You can follow her travels on Instagram.